Towel buying can be confusing at the best of times. Are cotton towels or bamboo towels better? What does gsm mean? How can you keep your towels soft? We have you covered! The country of origin is a good starting point when considering quality. European cottons, such as Egyptian and Turkish cotton, are well-known for their fine quality. They are also known for their ethical production methods, as opposed suppliers operating in other continents. Cotton is the most popular toweling fabric, although, poor quality cotton can pile and become course quickly due to its shorter fibre length. It pays to look for a longer fibre; European-derived cotton is always a safe bet. Bamboo, hailed as the new wonder fibre, is natural and eco-friendly. It is also known for its antibacterial, antifungal and odour resistant properties. Fibres within bamboo are extremely absorbent, allowing you to dry your body more thoroughly and quickly with a bamboo towel, in comparison to a cotton towel. The fibres are round and smooth, allowing for a comparable softness to cashmere, boasting a luxurious feel. Grams per square metre or gsm is the standard unit of weight used to measure towels. The higher the gsm, the more absorbent the towel will be – and the more luxurious. Every towel is made up of two components; a pile and a base weave. The pile is essentially the loops of a towel – the number and length of loops, the thickness of the yarn and how tightly the loops are integrated all affect the absorbency of a towel. Thinner yarn leads to thinner loops which leads to more surface area for the water to be absorbed. These lightweight towels are perfect for high use areas in the home, such as the kitchen. Tea towels and thin hamam wraps fit into this category as they are quick to wash and dry. It is recommended to have a few of these lying around as they tend to have a high turnover rate. Medium weight gsm are great for beach towels and cotton bath towels. As the gsm weight increases, the heavier the towel becomes and the more absorbent it gets. They are still quite light and fast to dry. Baksana’s cotton towel range is 600gsm which provides absorbency, quick dry and durability. Heavy weight towels are the most absorbent towels as they are warm, thick and luxurious - it is a premium product. 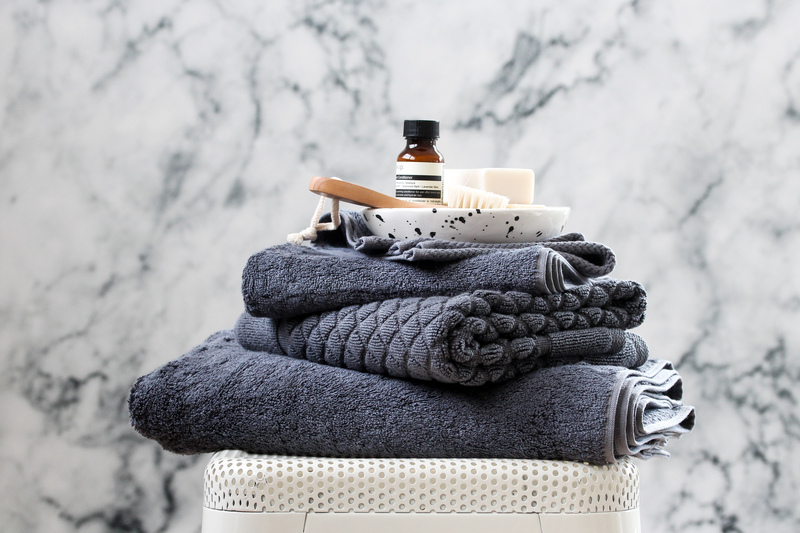 Towels of higher weights tend to be more expensive, however, if cared for properly, they will last longer than lighter weight towels. Baksana's bamboo towel range is 700gsm which boasts softness, warmness, incomparable absorbency and luxury. Baksana boasts quality, so when it comes to towels, we only produce the most luxurious products for our customers to experience. Our range comprises of cotton and bamboo towels in various sizes and colours – the perfect reason to revamp your bathroom. With a name inspired by the coastal region of Turkey, with its fruit orchards and bustling harbour lapped by the glittering waters of the Mediterranean Sea. 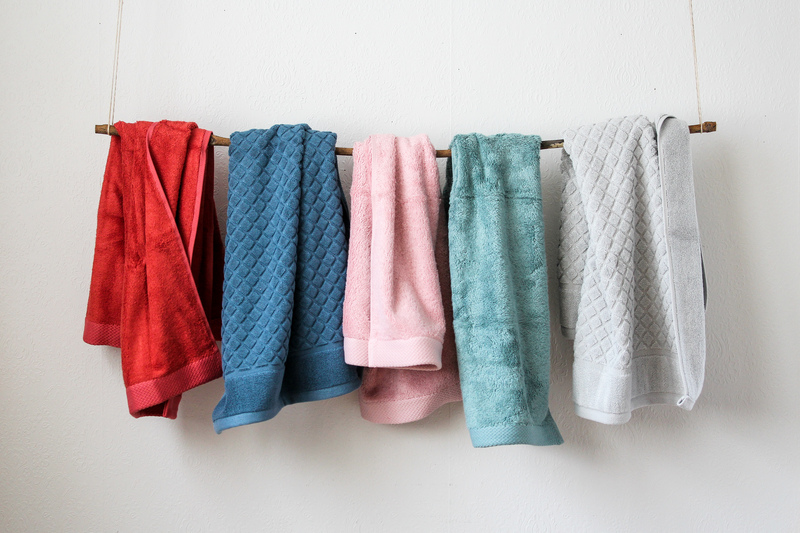 High quality Turkish cotton is woven to create a plush and divinely soft 600gsm Terry towel. They are an easy to launder cotton towel and dry well, making these a perfect everyday towel in the home. There are 10 soft colourways available. The crystal blue waters of the Aegean Sea inspire the name of these superior cotton towels. More durable than Egyptian cotton, these 600gsm, 100% Aegean long-stapled cotton towels are super-soft and ideal for daily use. Available in nine gorgeous colours and guaranteed to brighten any bathroom! 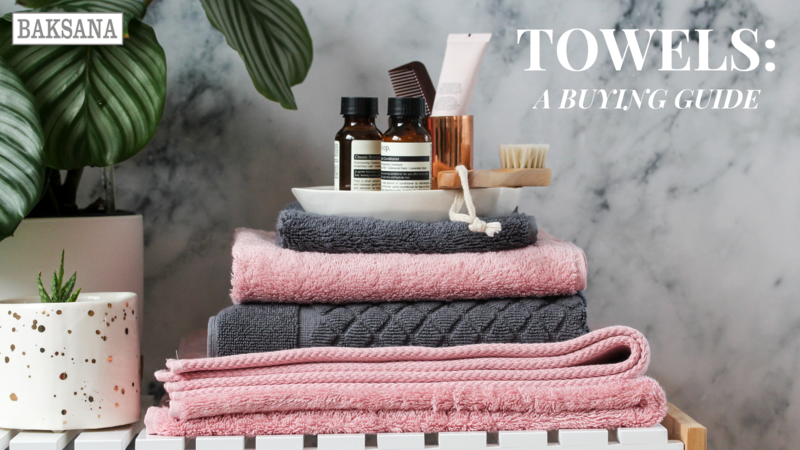 The Brooklyn towel features a subtle textured rice weave pile at 600gsm which creates a wonderfully soft towel as well as always looking neat whilst hung on the towel rail. Ideal for everyday use or beautiful as a guest towel, with good care these towels will last the years. Four Mediterranean inspired colours to add a calm sense to your bathroom. Finely woven in 60% cotton and 40% bamboo, Baksana’s bamboo towel is a luxurious addition to any bathroom. Unbeatable for natural softness, these towels are four times more absorbent than 100% cotton towels. Hailed as the new wonder fibre, bamboo is natural and eco-friendly. Dyed with certified natural dyes and finished without dressings, these towels are a treat for even the most sensitive skin. With 19 colours available, there is a colour to suit everyone! All Baksana’s towels have been Oeko-Tex certified which means they have been tested to ensure no harmful chemicals have been used. Each of Baksana's towels have also been prewashed and pre-shrunk, with good hydro-filtering to ensure they are dust free! Purchase a face cloth as an equivalent of a ‘tester pot’ for colour and style best suited to your bathroom. Don’t be afraid of colour – bold colours will brighten your bathroom and create a sense of contrast. Buy two different colours for a dynamic, tonal look you can layer. 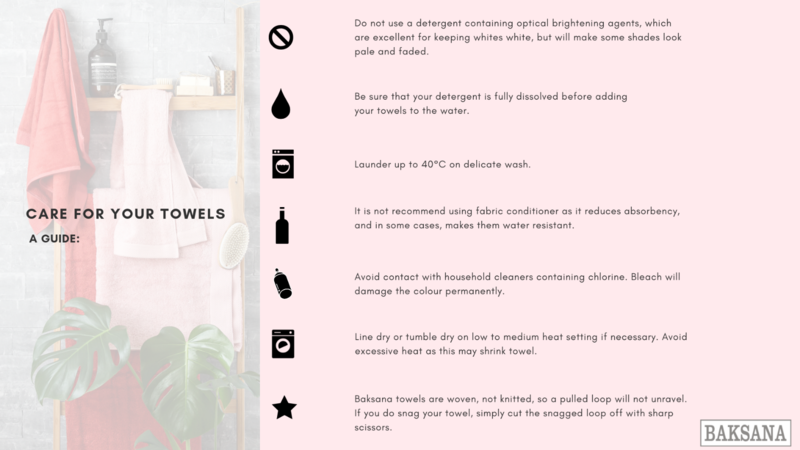 Establish the main use for the towels and choose accordingly, using the above guide.